Our first night train from Goa to Kochi went smoothly apart from the fact that I didn’t sleep much. We stayed only one night in Fort Kochi which was plenty enough as there’s not much to do and the town is disappointing compared to the “extraordinary” adjective the Lonely Planet was giving it. A (bumpy) 5 hours bus ride the next day took us in the Western Ghats mountains. 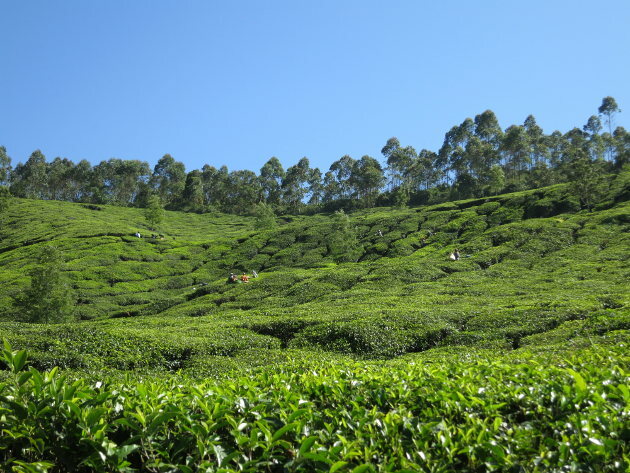 Munnar is a busy little touristic town perfectly located in the center of the tea plantations. The landscape there is simply amazing, the tea trees covering all the mountain sides in the area. The trees are all the same height and narrow paths between them allow the workers to move around. I found the mountains to have a garden like appearance which I liked a lot. The tea leaves are collected year round, every two weeks. Everything is done by hand, no heavy machinery there. Given how steep the mountain sides can be, it would be hard for a machine to do the work. We stayed in Zina Cottages which is 4 km away from town but perfectly located in the middle of the plantations. The view from there was beautiful. I would greatly recommend this place (the only negative point being the hard mattresses). In the short time we were there, we trekked trough the plantations and went for a ride up to Top Station, a beautiful viewpoint. Overall, Munnar was the best and most original place we went in India yet. To conclude our small Western Ghats trip, we stopped for a couple of night in Kumily to visit the Periyar Wildlife Sanctuary. The bus between the two towns was quite a ride with some beautiful landscapes. 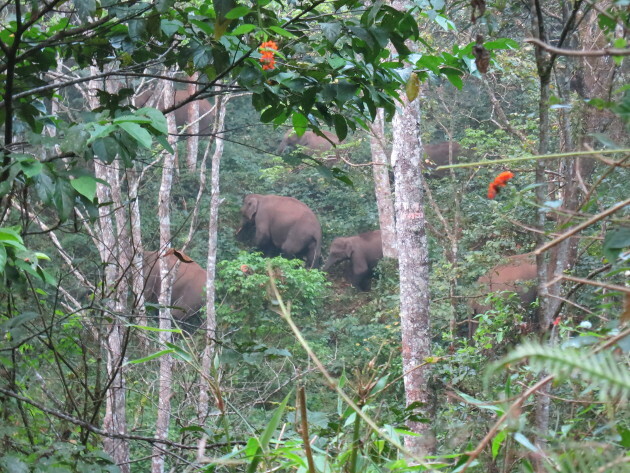 During our day trip to the sanctuary, we were lucky enough to encounter a big family of wild elephants as well as more common animals. We’re back on the coast for the next few days. I’m writing this from Allepey from where will do an houseboat cruise in the famous Kerala Backwaters tomorrow.